An innovative technology for energy transportation can only be disruptive, if it can be successfully applied to connect supply with demand. Cyprus Hydrocarbons Company (CHC), together with its GASVESSEL partners Sintef and VGT, have investigated multiple scenarios to connect gas sources with potential target markets with the GASVESSEL concept. The description and characterization of the identified scenarios include preliminary value chain cost evaluation, aiming to reveal where the GASVESSEL concept can add value. Developing a new technology, such as the GASVESSEL, is definitely an exciting project to be part of. For CHC, working on scenarios description and characterization was a stimulating experience because it combined both technical with commercial considerations. Special focus has been given to identifying different case studies for applying the GASVESSEL concept by connecting different gas source locations with their regional markets. The final proposed case studies are based on 3 geo-logistic regions: the Mediterranean Sea, Northern Europe and the Black Sea. Scenarios within these regions have been filtered further by applying both technical and commercial criteria. The preliminary analysis of the results, as well as the feedback from the process, are currently being discussed with the technology designers to identify the advantages of the GASVESSEL concept as well as opportunities for improvement. For the description and characterization of the scenarios, technical considerations had to be taken into account, such as GASVESSEL’s carrying capacity, maximum and minimum distances and loading/unloading times. The resulting case studies include scenarios of onshore and offshore gas loading options, varying reservoir gas volumes, different gas demand profiles and different shipping distances, providing a wide range of potential applications of the concept. Apart from the technical challenges that will be tested by the technology designers, each scenario will also be tested on economic criteria. 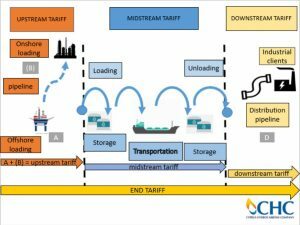 At this stage, the scenario description presents a preliminary estimation of the cumulative tariff, which was estimated based on the costs of different parts of the value chain, gas prices of the target markets and costs of the competitive monetization options, where this information was available. As part of the work led by CHC, a mathematical model is being prepared by ESTECO to receive the economic and marketing data. Different scenario profiles will be tested on sensitivities such as vessel’s speed, loading and unloading time, use of intermediate storage facilities and combining options of different smaller target markets to enable the model to identify the optimum route for the GASVESSEL concept. Illustration of the proposed gas-value chain from loading point to delivery point using the GASVESSEL concept. Costs at every step of the value chain are used to calculate the cumulative end tariff. A) East Mediterranean scenarios, where gas is supplied by potential gas locations offshore Cyprus and the gas is then delivered to three different target markets: (1) small markets isolated from the gas grid, such as Cyprus and Crete; (2) small to medium-sized gas markets, with existing gas infrastructure but not connected to the gas grid yet, such as Lebanon; (3) large, mature and well established gas markets for which it is estimated that gas can be easily absorbed, such as Egypt. B) Northern European scenarios, where gas is transported from gas fields located in the Barents Seas to entry points of existing gas-pipeline routes connecting Norway and the UK. C) Black Sea scenarios, where gas is loaded from nearshore Georgia to feed the market of Ukraine in an attempt to provide flexible alternative options for delivering gas to Europe. ESTECO’s optimization model is almost complete, however, substantial work is still required on cost estimation in certain areas of the value chain as well as the finite estimation of the cost of the GASVESSEL technology.